Feeling sudden pain in the sternum from stress can be a frightening experience. When you experience a sudden pain in the center of your chest, your first thought may be the possibility of it being a heart attack. It is often difficult to tell whether or not the pain you are feeling has a serious, and possible life threatening cause or if something less serious is causing it such as stress or indigestion. 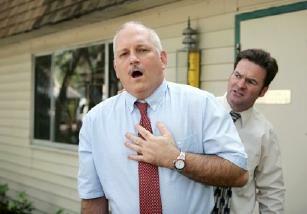 With any type of chest pain the best course of action is calling 911 or getting to a hospital immediately. Stress is often the cause of sudden pain in the sternum, which is located in the center of your chest. Also called the breastbone, the sternum is a flat long bone that connects to your ribs with costal cartilage. The sternum and the ribs form the rib cage which protects your heart and lungs. Two medical conditions that cause the onset of sudden pain in the area of the sternum and can be triggered by stress are angina pectoris and costochondritis. Angina pectoris, generally called angina, occurs when there is a reduced flow of blood to your heart. When people experience angina, they often feel a sudden pain in the center of their chest. The pain begins just behind the sternum or is centered just to the left of the sternum. Depending upon the person, the pain may feel like a crushing sensation or make your chest feel tight and constricted. Angina is usually caused by atherosclerosis, which is a buildup of fatty deposits that cause the arteries to thicken and become partially or fully blocked. The blockage reduces the flow of blood to the heart reducing its supply of oxygen. Stable angina is a recurring and persistent chest pain that occurs with physical exertion or when you are experiencing severe stress or anxiety. This type of angina is caused by a heart working harder. If you have stable angina and experience a sudden, new or different type of chest pain or a change in the pattern of the pain, it may be a forewarning of a possible impending heart attack. Unstable angina can occur when your heart is at rest. This type of angina does not have a pattern and can happen at any time. Typically the symptoms of unstable angina are more severe with longer lasting pain. Variant angina can occur at any time and is caused by a sudden spasm of an artery. This type of angina is more common in the early hours of the morning. An inflammation of the costal cartilage that connects the ribs to the sternum, costochondritis often causes sharp sudden pains in the joint where the sternum and the ribs join, called the costosternal joint. Although in most cases of costochondritis the cause is unknown, it is known that stress often triggers and exacerbates the condition. A stressful event that causes an acute stress response or dealing with long term chronic stress both trigger the body's fight or flight response. That response, also known as hyper arousal, causes many physical and physiological changes to occur in the body as it readies itself to fight or flee, including chest pain. The physical changes that occur include the contraction and tightening of the muscles, an increase in respiration and an increase in heart rate. These changes often cause a sudden pain in the sternum from stress. Learning stress reduction methods and techniques will help to lower your overall stress level.